Football is no stranger to military analogies – box to box midfielders have become known as ‘midfield generals’, full-backs ‘bomb forward’, the pitch is described as a ‘battlefield’, the Germany national team is much-revered for its ‘military-like efficiency’ and one of their greatest players – Gerd Muller – was nicknamed ‘Der Bomber’. Yet very few players actually possess this romanticised military background. Katongo is one of the few who does, being a soldier since 2001 when he joined Zambia army club Green Buffaloes. Naturally, Katongo is a one-man army, the mere appearance of him relentless and overwhelming, a 29-year-old, constantly simmering pan of boiling blood as he surges through attacking areas with the vigour of capitalist society commuter who is late to work. It was no surprise, then, that he was promoted to Warrant Officer Class One in the Zambia army by Zambia’s President during the tournament for his skill and exceptional leadership skills. Katongo is the type of player who could play for any team in the world and not look out of place. Even Barcelona. After all, Ludovic Giuly didn’t look out of place in a Barca team including Messi, Ronaldinho and Samuel Eto’o and I like to think of Katongo as Zambia’s answer to Ludovic Giuly. But better. It’s that look. The best athletes – the Roger Federers, Michael Jordans, Usain Bolts of this world – have that look, the look of tunnelled focus in pursuit of victory. Katongo has that look, Messi doesn’t have that look. You know that look that I’m talking about. 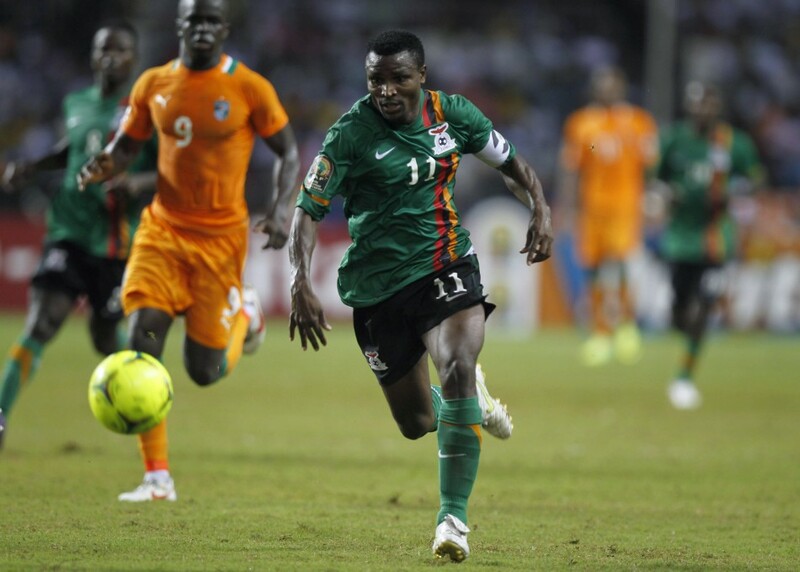 Katongo had a fiery, clenched face and an intense, strong-willed stare whenever we saw him pull on the Chipolopolo jersey at the Cup of Nations. It’s only now that I realise what the look was about – he was visualising the moment he’d lift the Cup of Nations, a vacant, focused stare into the swagger of victory. If that isn’t enough, a bright white armband tightens around his left arm which complements his bright white boots – which you can’t miss as they dot around the field. Katongo simply stands out from the crowd, even if you don’t want to know him, you will. Messi, meanwhile, has standard South-American hair which, whilst being perfectly lovely, just about every South American playmaker or attacking player has had over the history of football. I could try and look like Katongo and copy his style and swagger but I can’t. You either have that look or you don’t. That look I speak of adds to the Katongo Petty-Thief Theory. There are some footballers who shouldn’t be playing at the highest level at all – they are thieves, they’re not earning a living, they’re stealing a living instead. Katongo has something resembling a petty thief you’ll find in a Lagos slum – this raw, swirling streetwise appeal apparent in his razor-sharp shape up, an appeal that his football career, which has taken him to foreign lands, has been unable to refine. Cruelly, for example, it was actually the dazzling left-winger Rainford Kalaba who deserved to win the 2012 Cup of Nations player of the tournament – many who watched the Cup of Nations would agree with that statement – yet you couldn’t ignore Katongo, despite the way he faded in the knockout stages you knew that without his leadership Zambia wouldn’t have won the Cup of Nations. The moment when you score a goal is the opportunity to release all your frustration or taunt the opposition. For some players, there a few things better than scoring away from home and knowing that they are responsible for the silence that dominates the stadium. Against co-hosts Equatorial Guinea Katongo scored the winner and then choreographed a celebration which told the crowd to hush (but in a polite manner, with a sumptuous dance to go with it) – a celebration that reduced the atmosphere in the Estadio de Bata stadium more joyless than that of a coffin. It was a celebration Katongo choreographed throughout the tournament and my personal favourite. Messi doesn’t celebrate like that, even when he scores a late winner against Real Madrid. Near the end of last season, Messi was left on the bench for a La Liga fixture because Pep Guardiola wanted to rest him for a midweek Champions League clash. The Argentine refused to train the next day, absent from training, angry that it meant he wouldn’t be able to eclipse Cristiano Ronaldo in the goalscoring stakes. Christopher Katongo is the footballer’s footballer; he doesn’t do strops and he always arrives early for training. When things weren’t going well at the Cup of Nations, like in the soggy, splashing conditions against Libya when Zambia went twice behind or the relentless pressure they had to endure from Ghana in the first half of the semi-final, young Nathan Sinkala or any other team-mate of Katongo’s only needed to have a look at Katongo’s feral intensity to know that they would get through this and everything was going to be alright. 1. Maybe we are too used to his brilliance, but Messi is never boring to watch. Not to me, at least. Although I think Messi has ‘that’ look. 3. I am surprised you didn’t mention Messi’s not-so-good performance with Argentina, which makes him less of a perfect player – if there is such thing, and actually puts the comparison in favour of Katongo. Awesome article ! ! ! before. So good to find another perseon with a few unique thoughts on this issue.